Since the first website was launched in 1991, the general look of the Internet has undergone dramatic changes. What seemed wondrous, say, half a decade ago does not arouse former enthusiasm anymore. Worse yet, it may be unacceptable now if it has a negative impact on the website usability. At the same time, there are some web design trends that have taken deep roots in the industry, even though it is constantly changing with the rapid technological progress. If you want to have the edge over online competitors, it’s vital to be aware of what matters in the look and functionality of sites today and what has already lost its original value. To help you explore such a vast subject, the TemplateMonster team has released an eye-catching infographic (click here to take a glance at it). 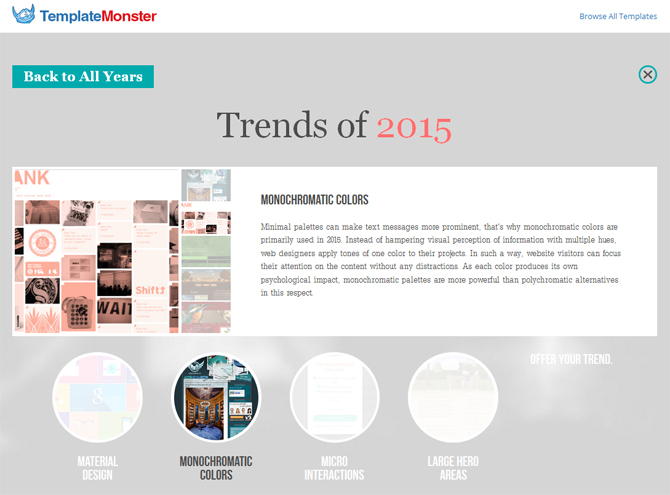 It embraces web design trends over the last decade, from 2004 to 2014, and even those that are expected to emerge in 2015. For better understanding, each description is accompanied with several images to demonstrate how a certain tendency is employed in different resources. Sections for the current and previous years include 5 topics while the one for 2015 contains only 4, with a vacant place left for your own prediction. Don’t hesitate to share your opinion about the way web design may change in the upcoming year there. Moreover, you can look through the hottest trends from the TemplateMonster infographic below to find a solution to your website design. Material Design. Based on the concepts of reality, this trend set by Google conveys interaction of objects in rationalized space through light, surface, and motion. Monochromatic Colors. Comprising different shades of one color, a monochromatic palette makes the overall design smoother and brings typography to the spotlight. Large Hero Areas. Being the first focal point of a website, a big header image with a short text message provides visual story-telling experience. Microinteractions. Attached to the most prominent places of websites, these pieces of functionality help expand a customer base and increase conversion dramatically. Code-Free Designs. With the development of tools providing automatic code generation, you can bring your ideas to the digital canvas without any programming knowledge. Flat Design. Due to minimal use of simple elements, this trend encourages faster loading, easier resizing, and sharper look of web pages on HD screens. Metro Style. Featuring well-organized blocks, this clean trend brings typography to focus, while graphics is put into the background. Mixed Typography. A skilful mix of fonts can set a sharp typographic contrast in the user interface, which improves legibility and readability of content. Minimalism. As user experience is the top priority, designs should be simple and clear without any attention-distracting elements. Responsive Design. With the adaptation of website layouts to screens of mobile devices, it became possible to reach individuals who browse the web on the go. These are only some of the trends listed in the TemplateMonster infographic. To learn more about the web design evolution and choose ideas for your site, follow this link, please. I believe this is one of the most vital info for me. And i am glad reading your article.